Dhaka, Jan 2 (Just News): Dr Kamal Hossain and five other leading jurists of the country on Monday said in a statement that the lower courts have been made subordinate to the executive by three “cardinal rules” involving the lower court judges. The independence of the judiciary has been undermined and the separation of power has been violated by the rules, they said in the statement without mentioning the names of the rules. The five other jurists are Barrister Rafique-ul Huq, Barrister M Amir-Ul Islam, Barrister Mainul Hosein, Advocate AF Hassan Ariff and Barrister Fida Kamal. They made the statement on the occasion of observation of the Supreme Court Day tomorrow (Tuesday). The three rules include the recently formulated “Bangladesh Judicial Service (Discipline) Rules 2017”, Barrister M Amir-Ul Islam and Advocate AF Hasan Ariff told The Daily Star. The government on December 11 last year issued a gazette notification on the disciplinary rules [Bangladesh Judicial Service (Discipline) Rules 2017] keeping the president's authority over their conduct. Under the rules, the president will make necessary decisions in consultation with the Supreme Court, and the law ministry will implement those. “While we recall the important decision in Masdar Hossain’s case, we cannot but express grave concern that the protection extended by that decision to the independence of the judiciary has been undermined by three cardinal Rules as are to be made under Article 115 & 116 [of the constitution] for the subordinate judiciary now framed under Article 133 under the Execute Chapter, thereby treating the Judges of the subordinate judiciary having been made subordinate to the executive branch. 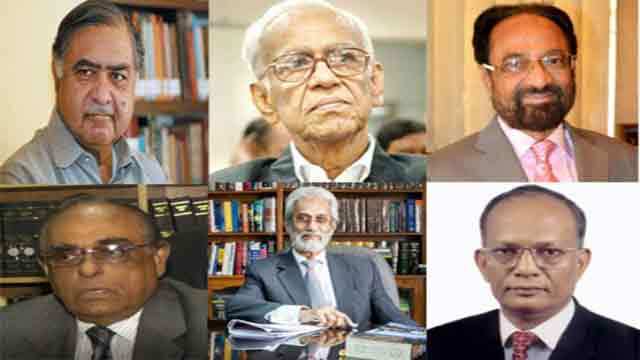 It has thus violated the scheme for separation of power further sanctified by the judgment in Masder Hossain Case,” the six eminent jurists said in the statement today. “Those Rules as are mandated under the Constitution now framed in a non-transparent manner and without due deliberations, nor following effective consultations with both Divisions of the Supreme Court of Bangladesh,” the legal experts said. “The subordinate judiciaries’ appointment and transfer have thus been placed under the Executive Branch (Chapter-II - The Prime Minister and Cabinet). This being done while the seat of Chief Justice kept vacant creating a void thereby in the Republic itself. In the process judiciary has been placed under the authority and control of the Executive Branch taking the country back in 1999 in the Pre ‘Masder Hossain’ era,” they also said. “At this juncture the Supreme Court is without its head (chief justice) and judicial organ of the republic continues to remain without the chief Justice,” they said. For the first time in history, Bangladesh will celebrate “Supreme Court Day” tomorrow. The SC authorities will organise a meeting at the Supreme Court Judges’ Sports Complex tomorrow afternoon to observe the Supreme Court Day. President Abdul Hamid is scheduled to attend the meeting as chief guest, while Justice Md Abdul Wahhab Miah, who is performing functions of the chief justice, and other judges of both the Appellate and High Court divisions will attend the occasion.